The point of this blog is that I will try and give you some ideas for things to do with your small children when you have totally run out of idea for things to do with your small children. I had lots of moments when R was very tiny when I’d bounced her on my knee, sang all the nursery rhymes I could think of, blown some bubbles etc, and I just thought…now what? Now she’s a bit older (she’s two) it’s a bit easier but sometimes it’s hard to think of fun things to do that don’t just involve sticking her in front of a Peppa Pig DVD with a packet of chocolate buttons. Fortunately for me, there are some amazing online resources for ideas. If you haven’t checked out The Imagination Tree, then all I can say is – do it. There are some great activities for kids of all ages. I particularly liked the Eric Carle Tissue Paper Prints – The Very Hungry Caterpillar is a big favourite here, R’s room has a Hungry Caterpillar theme and she loves the story – so I was really keen to do this with her. When we tried this, R was about 19 months old. Obviously I had to give quite a lot of help but she seemed to really enjoy making the patterns. The tissue paper ripped quite a bit, so I can recommend trying to get hold of the thickest kind you can, but plenty didn’t rip so we still managed a decent effort. 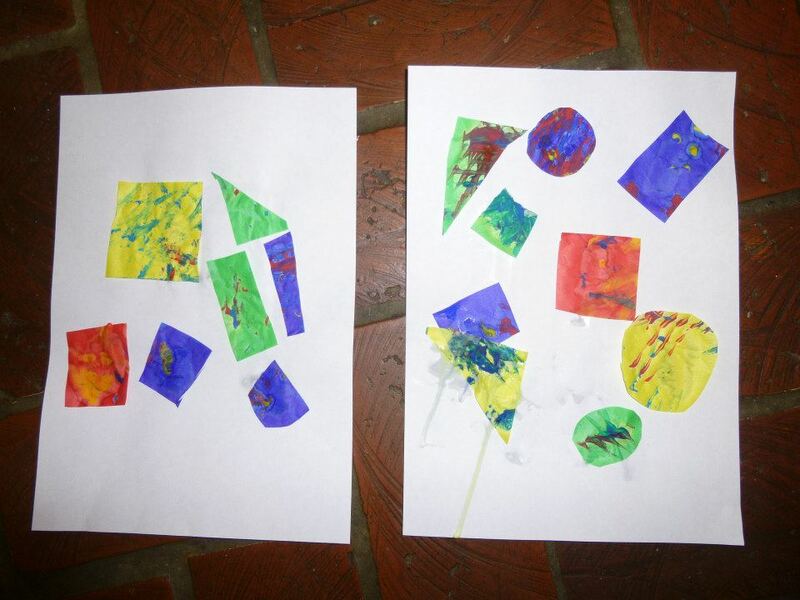 This entry was posted in arts and crafts and tagged art, Eric Carle, Hungry Caterpillar, tissue, toddler. Bookmark the permalink. Looking forward to your suggestions, Jo. My kids are into Musical statues at the moment. Although it is tough with two the same age, they do at least like to play together. Musical statues – I hadn’t thought of that. What do you play to dance to? Is it appropriate to play musical statues with some ska?